Easy to use and inexpensive, this is the most popular stylus force gauge on the market. An indispensable tool for any analog setup. 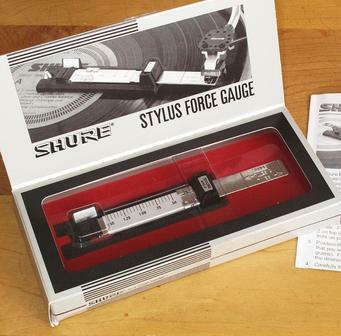 The Shure SFG-2 Stylus Tracking Force Gauge is the industry standard. This simple-to-use measuring device was developed to give listeners a way to insure against the problems caused by improper tracking force settings, which include mistracking, excessive record and tip wear, and poor sound reproduction. This gauge is a highly accurate beam balance instrument designed to measure the actual downward force exerted by a stylus on a record over the range of 0.5 to 3.0 grams. Each gauge is individually factory calibrated in order to provide a precise measurement of stylus tracking force.